KOREA: LG goes into the glass business in a big way to build its LCD future | What Hi-Fi? This investment is designed to boost its LED technology, and free itself from expensive imported glass for TV display manufacture. Earlier today the company held a ground-breaking ceremony for a new plant at its facility in Paju, S Korea, and announced that its LG Chem and LG Innotek divisions will invest a total of 4tn won, or around £2bn, in plants manufacturing LEDs and glass substrates – the sheets of material on which LCD display panels are 'built'. An 840,000sq m site will be developed, creating more than 4500 new jobs, plus a further 5500 posts with affiliated companies. The first production line will be up and running early in 2012, with six more lines due to come onstream between then and 2018. By that time, LG Chem should have an annual production capacity of at least 50m square metres of glass. The development will realise LG Group chairman Koo Bon-moo's ambitions to cut the company loose from its dependence on glass imported from overseas, which accounts for more than a fifth of the materials cost for LCD display panels. At the moment, only four companies have the wherewithal to make the precision glass required for these panels. 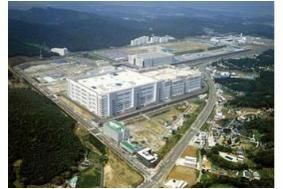 US-based Corning is the largest of these, with a joint venture in Korea with Samsung, plants in Taiwan, and a co-located facility at Sharp's Japanese factory on the way. Japanese companies Asahi Glass, Avanstrate and Nippon Electric Glass are the other major players.